5 years! That’s a big deal! Here at StaxUP Storage, we know our success is due to our outstanding team. 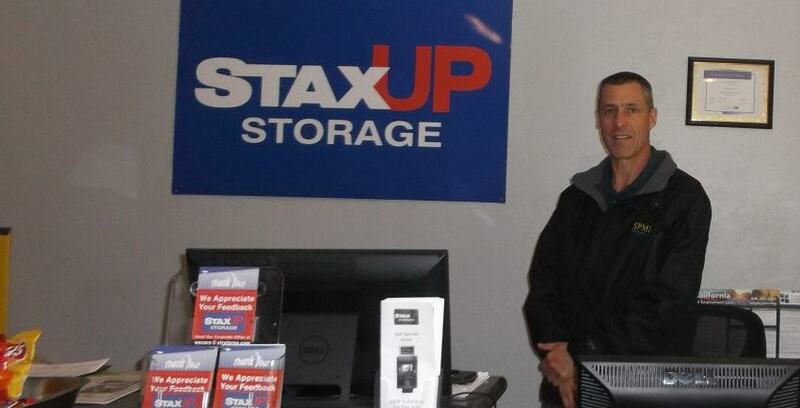 Below is an interview with Paul Mauer, who is celebrating his 5-year anniversary with StaxUP Storage. Jodie: Hey, Paul! I’m glad we could chat about your 5-year anniversary with StaxUP Storage in El Cajon. Happy 5 years, that’s a long time! Was it on the 23rd of December? Paul: I guess it is these days! It used to be if you stayed at a job for 40 years that was a long time, but now If you stay for more than 2 years it’s a big deal. Jodie: What were you doing for work before working in self storage? Paul: I was doing maintenance before, actually I moved here from the State of Wisconsin five years ago, and I was maintenance at a state facility back there, and when I came here there wasn’t a lot of maintenance positions open and I wanted to work with people and I saw this position open and saw that it worked with people. Jodie: What do you like best about working for StaxUP Storage? Paul: One of the things I like about working for the company is they like reaching out on the Christmas event that I do and the carwash I’ve done in the past. I like being a part of the community. We do a school drive as well, where the company buys items and we collect school supplies and then we give them out. Jodie: How has your role changed over the past 5 years? Paul: The fact that I know the people very well here, that has made it nice, because I’ve been here for such a long time. People watch out for one another. It makes life a lot easier. Jodie: Can you point back to a time in the last 5 years when you made an impact on someone’s life? Paul: Yes, there have been a lot of people. I guess to mention one, the last time was during our Christmas event here. Usually, the church across the street gives us a name of a family, but the pastors are not there anymore, so I didn’t know what I was going to do because I wanted to help someone! So, I’m involved in a group called Victory Outreach that helps people who deal with addiction and abandonment. I found a family from there which included a woman who was in a shelter with her four boys. Paul: So I collected donations and we bought stuff. I went over to their house and the kids were all jazzed up and we took pictures. It was really neat. You could tell it meant a lot to them, you could tell. It wasn’t much, but I was able to encourage them too. It was really fun and I enjoyed being able to do that this year. Jodie: How old were the kids? Paul: 11, 8, 6, and 2. Jodie: Did you have to take money out of your pocket to pay for the gifts or were you able to raise money in your store? Paul: Yes, that’s how we do it. Basically, as a store we bought candy bars and then sold them and that money is the money we used to purchase gifts for them. In the past, that’s how I’ve done it. I’ve sent out an email. In fact, one year, a customer bought a gift for each and every one of the kids, and last year someone decided to wrap all the gifts. Usually, we do two families, but I was glad we were able to help one. Jodie: What inspires you to give as you do? Coming from Wisconsin, where do you get that drive? Not a lot of guys I know out here in the Midwest would just give like that. Paul: I appreciate your honesty! I tell people women do tend to give better than men all the time They are the ones who take the time and write the positive reviews. You know, it’s my relationship with Christ. Since that time, I try not to focus on myself as much as I usually do. And I really appreciate what he’s done in my life. I was pretty selfish like we all can be. Now, I want to give back. It is better to give than to receive. I didn’t believe that many years ago like I do now and it’s such a neat thing. That’s the same thing here at the storage facility, you know people come in and are discouraged and frustrated because they’re going through divorce, or death. The last thing they need is more pressure from me, so I try to help them out. It’s just great to see, you know, give them some kind of hope. Jodie: Congrats on five years with the company, Paul. We are really lucky to have you!